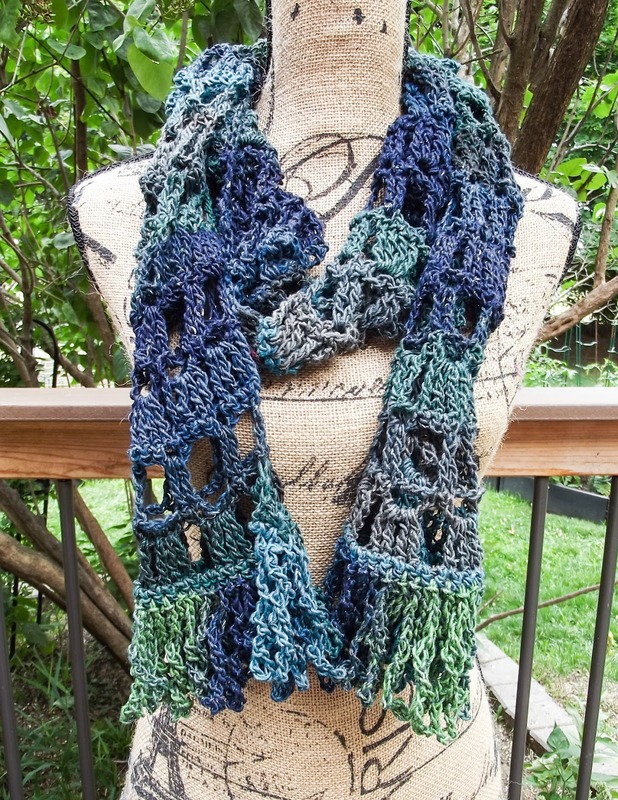 I haven't posted in such a long time that I thought I'd offer a little treat today -- a free crochet scarf pattern. This pattern is quite easy, and works up quickly, with an easy to remember four row repeat. 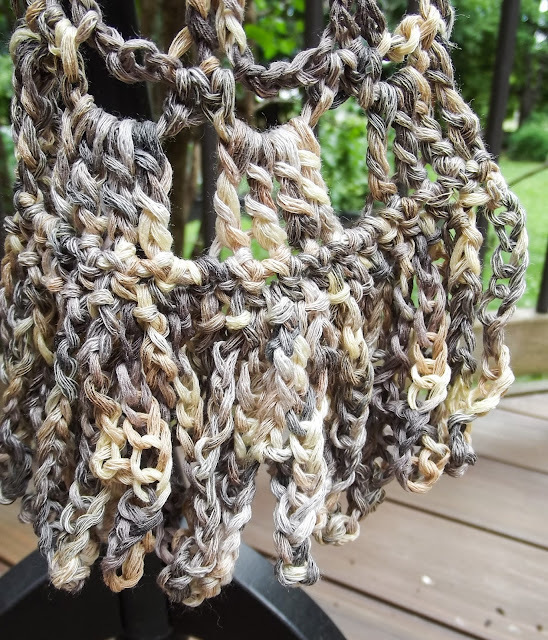 Because the fringe is worked in loops of chain stitches as the final row at each end, you don't have to go through the additional steps of finishing off, measuring and cutting fringe, and attaching it. One of the great things about this scarf is that because it is a fairly open, lacy stitch pattern, you can wear this piece comfortably in any season. For example, if crocheted in a cotton or linen blend yarn, it makes a wonderful accessory for summer. 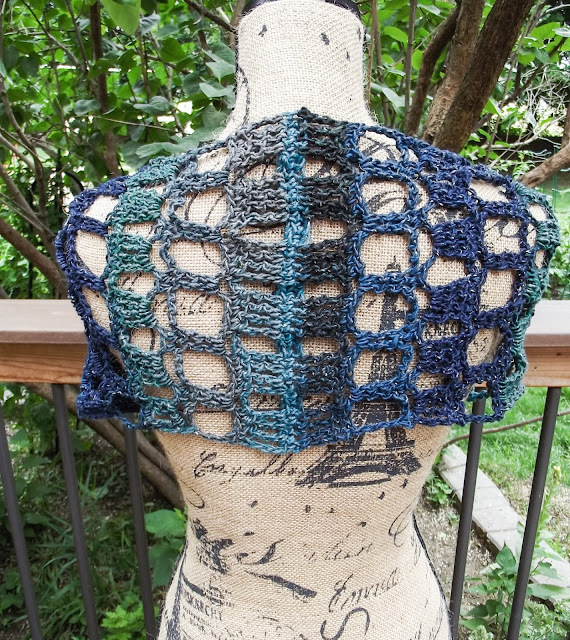 Another nice feature of this pattern is that you can easily change the width or length; even crocheting it as a shawl, if you wish. Just adjust your foundation chain (you need a multiple of 6 +5). The version shown above in the blue/green, Color 42 of Plymouth Yarns Kudo, is worked on a foundation of 35 chains (30 +5). I call this my "Colosseum Scarf" because the stitch pattern reminds me of the arched windows of the Roman Colosseum. 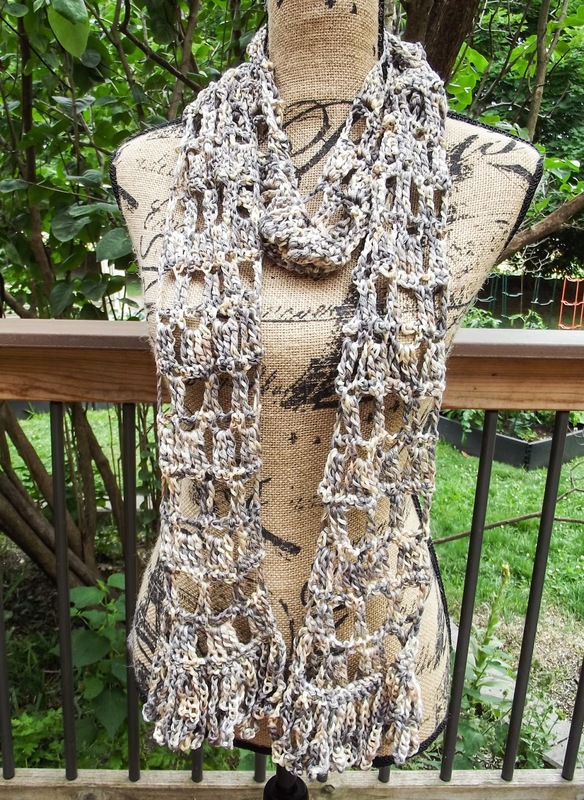 Below, you will also see some photos of a narrower version that I crocheted using Trendsetter Yarns Zensation. For this one, I started with a foundation of 23 chains (18 +5). I hope you enjoy making this pattern! I'd love to hear from you about your experiences with making it. 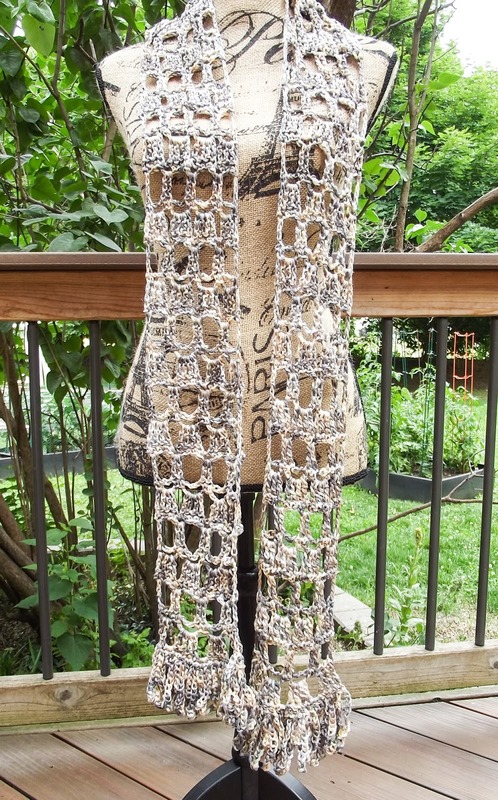 This scarf is worked outward from the center. One side is completed and then the yarn is rejoined in the center and the other side is completed. Fringe row: ch 1, sc in first sc, *ch 25, sc in next sc*, repeat from * to *, ending with a sc in the final sc (total of 33 fringe loops). Finish off, work in your ends. 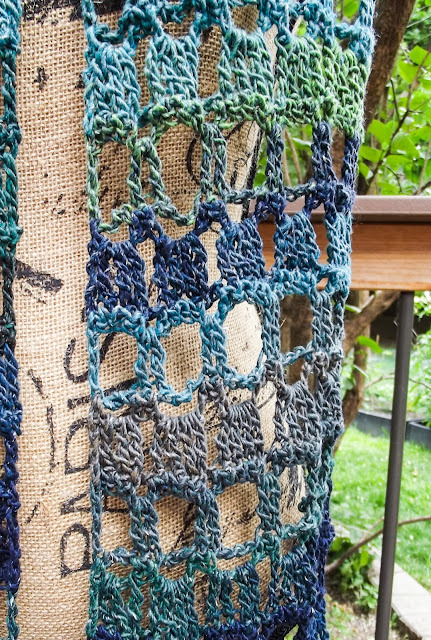 With right side facing you, attach yarn by working a slip stitch in the unworked side of the first ch of the foundation chain. Row 1: Work Row 2 of first half. Rows 2-42: Work Rows 3-6 of the first half 10 times (or until you reach the desired length. Row 43 and Fringe Row: Work the same as for the first half. This pattern is my own design. I don't mind if you copy it for your own personal use, but please do not sell it. Further, please do not disseminate it to others without attributing the design to me and/or linking back to this page. To do so is a violation of my copyright. 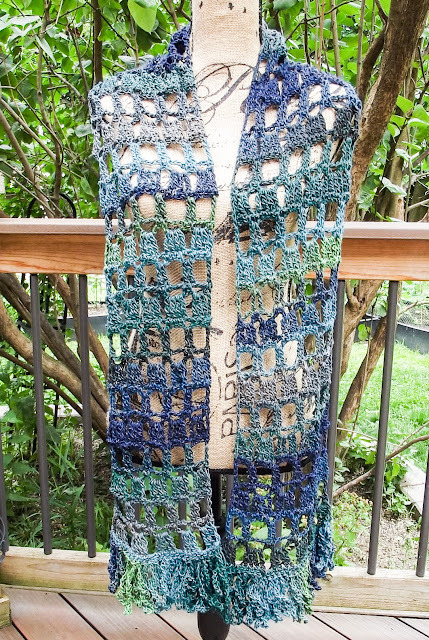 If you wish to sell finished versions of scarves you crochet from this pattern, that is not a problem. However, again, I would just ask that you respect my work by indicating that I am the designer. Thank you!